2 volumes: Book I, Static Features; x+291 pages with diagrams and index; Book II, Dynamic and Subjective Features; xi+344 pages with diagrams and index. Octavo (8 7/8" x 5 3/4") issued in reddish brown cloth with gilt lettering to spines. 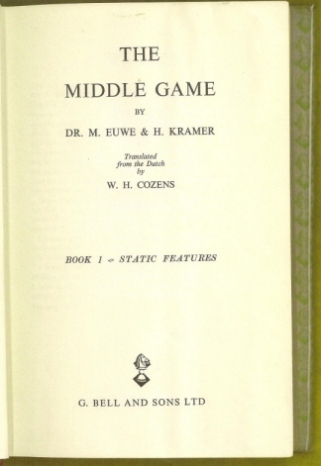 Originally published in Dutch as parts 1-12 of Het middenspiel (1952-64). Translated by W H Cozens. (Betts: 18-17; 18-21 First British edition. The first volume "static features" is to identify those features of a given position which have more or less lasting properties and from them to assess it potentialities. 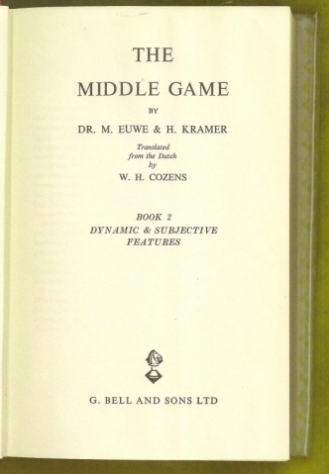 After considering the relative value of pieces, the authors examine center formations, closed, open and half-open formations, the struggle for open lines, and weak pawns - illustrating their theme with many examples from master play. 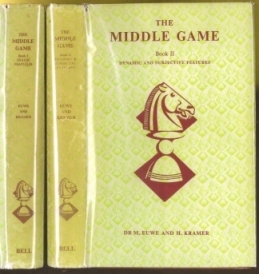 In the companion volume they examine the initiative, the different types of attack on the king, the arts of defense, maneuver and liquidation and the common failings over the chess board to which even great players are occasionally subject. There theme is illustrated by master games. The final part of the book is devoted to a survey of the personal styles of thirty-eight grandmasters and World Champions - from Anderssen to Petrosian, from Morphy to Tal and Fischer. Old book seller's label to front end papers. Dust jacket corners and spine ends chipped, spine age darkened, some light soiling, edge wear with some small tears and chips, spines rubbed. A very good set in very good jackets.